Did You Know The World’s Oldest Marathon Runner is an Indian? Meet the Turbaned Tornado Fauja Singh! When asked how he managed to run the 26-mile marathon, 89-year-old Fauja replied: “The first 20 miles are not difficult. As for the last six miles, I run while talking to God.” At 101, he ran the London Marathon in 7 hours and 49 minutes. 104 today, he continues to run for fun. Here’s his incredible life story. “Fauja Singh, 100-year-old Indian born, British citizen, finished Toronto’s waterfront marathon Sunday evening, securing his place in the record books as the oldest person, and the first centenarian, to ever accomplish a run of that distance.” – CBS News on Oct 16, 2011, from Toronto, Canada. Here is the extraordinarily inspiring story of an Indian who overcame adversity to become the world’s oldest living marathon runner. Fauja Singh was born on April 1, 1911, in the village of Beas Pind, Punjab. Young Fauja was scrawny and sick as a child, often bullied by other children who called him “danda”, Punjabi for “as thin as a stick.” Fauja did not develop the ability to walk until he was five years old. His legs were thin and weak, and he could hardly walk long distances. He never went to school – instead, Fauja became a farmhand. Initially he would assist with odd chores like minding the cattle. But later, he began to help with tilling of the land and growing staple crops like wheat and maize. Working hard in the fields, Fauja grew into a strapping lad, tall and handsome, his traumatic early years as a sickly thin child quickly forgotten. He’d now reached a marriageable age and his parents soon found him a suitable bride, Gian Kaur. Fauja and Gian quickly settled into a domestic routine. Fauja worked on the farm and wife Gian Kaur managed the house. Over the years, they had six children, three boys and three girls. The proud parents watched as the children grew up, completed their education and began looking for jobs to begin their careers. Also, now came the responsibility of getting them married. One by one the children married and/or found jobs abroad in Canada and England and left Punjab. All except one – Kuldip and his wife decided to stay back and help Fauja and Gian with the farm. The years rolled by. Fauja and his wife, now living a content life with Kuldip and his family in Punjab, made several trips abroad to visit their children. In 1992, Fauja’s wife Gian Kaur passed away. Fauja shed many tears but accepted his fate and carried on. He was 81 now, he’d come a long way. Then, in 1994, tragedy struck again. His son Kuldip, who had been taking care of his parents all this time, was killed right in front of Fauja’s eyes in a construction accident. Fauja’s world turned upside down. His grief knew no bounds and life became empty for him thereon. Now almost 83 and unable to bear the loss of his beloved wife and son, each day became a burden for Fauja. It was then that his children, who were by now well settled abroad, decided to bring their father to stay with them. Fauja eventually moved to London to stay with his son Sukhjinder and his family; this was in the late 1990s. Though happy to be with his son, Fauja was still grieving inside; he just couldn’t come to terms with the loss of Kuldip, and his mind was still in India. However, like many others his age, Fauja too may have soon come to turns with this tragedy, spent his old age with his children and died a peaceful death. But life was about to take a glorious turn for this octogenarian. While watching television one evening, Fauja heard the anchor of a show inviting people to participate in the upcoming London marathon. This woke Fauja up from his slumber; he was back to his childhood days when he used to run errands for the family, tearing up and down the village streets. Well, that was almost six decades or so ago; he was now 89, not a youngster by any means. Nevertheless, Fauja, who had by now taken tentative steps out of the house to enjoy an early morning jog with members of his community, decided he’d give the London marathon a try. He, of course, had absolutely no clue what a marathon was. Asking around, he was introduced to Harmander Singh, an athletic coach and a marathon runner himself. Fauja explained to Harmander that he wanted to participate in the upcoming London marathon, hardly a couple of months away. Harmander is said to have shaken his head in disbelief. Fauja wouldn’t relent, he had made up his mind and nothing was going to change it. Eventually, Harmander agreed to coach Fauja. Here is an oft-repeated anecdote from the first day of training: it is said that Fauja turned up for training in a three-piece suit. Harmander was taken aback and had to chide Fauja that this attire was not exactly suitable for running a marathon. Coach Harmander Singh runs with Fauja in Valentines Park in Redbridge, London. With coach Harmander guiding him, Fauja finally began his training in right earnest. At long last he had a new goal in life and he began to come out of his shell. On race day of the 2000 London marathon, Fauja was one amongst the teeming tens of thousands who had turned up from around the world to participate in this prestigious event. The race began and Fauja ran alongside his coach, Harmander Singh. Six hours and 54 minutes later, Fauja crossed the finish line – he had run 26 miles and 365 yards. At age 89, he was a marathoner, having just completed his first marathon race, the 2000 London marathon. There was jubilation all around. Fauja had moved on finally and begun to lay the tragic events of his recent past to rest. This was a new beginning and there was more to come; he would soon be a star. Fauja entered the London marathon again in 2001, but this time with a record at stake. He needed to beat 7 hours 52 minutes to be the fastest marathoner alive over age 90. He broke the record by 57 minutes! When he turned 92, Fauja successfully competed in three marathons in the space of six and a half months, another remarkable record. 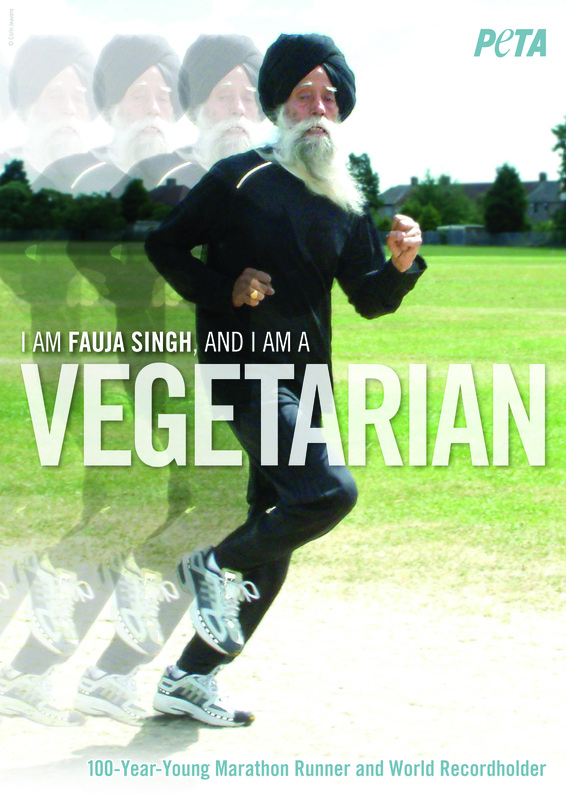 Fauja Singh would eventually become the oldest marathon runner, having participated in eight marathon races from 2000 to 2011. His personal best would be achieved in the 2003 Toronto marathon in Canada, where he clocked an astonishing 5 hours 40 minutes in the 42.195 km race – a stunning record for a 92-year-old runner. 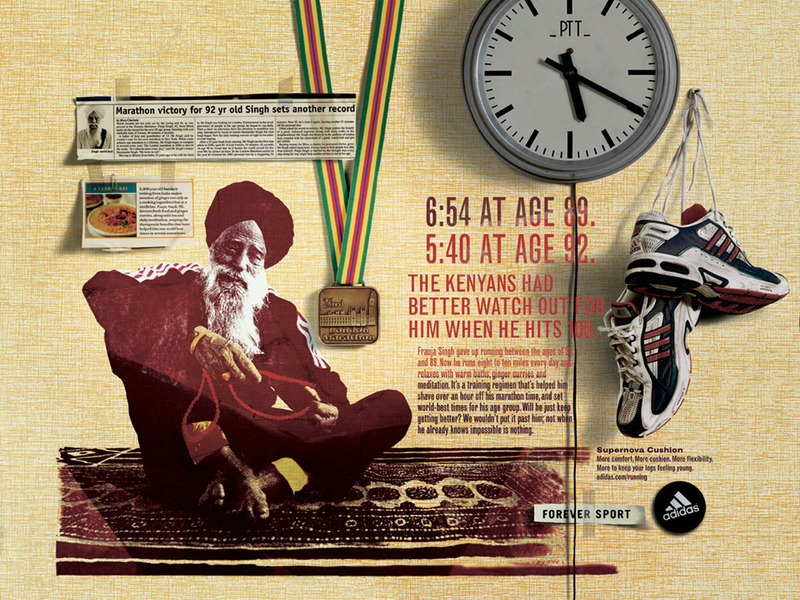 The year 2011 was the high point in the running career of Fauja Singh. In April 2011, he celebrated his 100th birthday and in October of the same year, he attempted and accomplished eight world age group records in one day, at the special Ontario Masters Association Fauja Singh Invitational Meet, held at Birchmount Stadium in Toronto, Ontario Canada. Timed by Canadian officials, He ran the 100m, 200m, 400m, 800m, 1500m, the mile, 3000m, and 5000m – setting five world records for his age group in one day. Each time he bested the previous record in that age division (some events had no previous record holder as nobody over age 100 had ever attempted the distance). 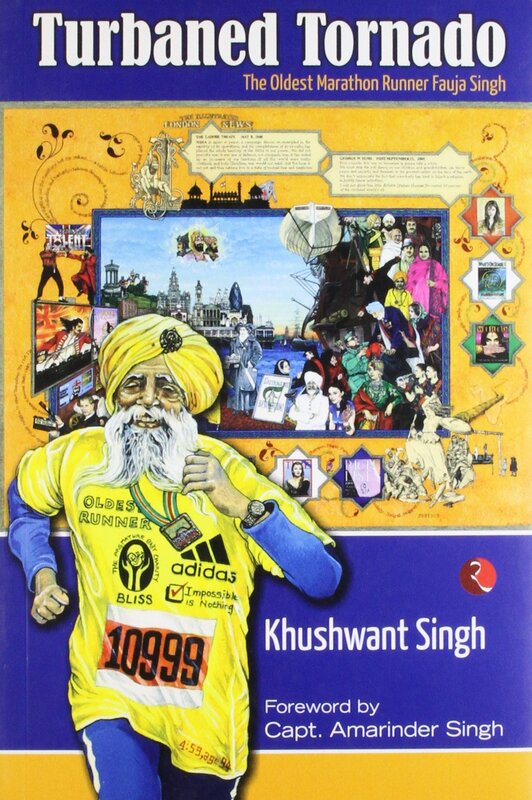 The icing on the cake, however, was to come on 16th of October, 2011, when Fauja Singh became the first centenarian to complete a marathon, the Toronto Waterfront Marathon, his time 8 hours 11 minutes 6 seconds. There were celebrations all around and he was feted by the world’s print and electronic media for this amazing achievement. The spotlight shone on Fauja! Fauja Singh has carried the Olympic torch on two occasions – at the 2004 Athens Olympics and the 2012 London Olympics. In 2014, the British Government conferred on 103-year-old Fauja Singh the British Empire Medal (BEM), for his achievements and for his charity work. His biography, titled Turbaned Tornado, was written by Chandigarh-based writer Khushwant Singh (not to be confused with Khushwant Singh, the prominent journalist). It traces the runner’s roots and tries to capture his life’s journey, including the impact of Fauja on the world around him. Fauja’s last marathon race was when he participated in and completed the Standard Chartered Hong Kong marathon on Feb 24, 2013, just five weeks before he turned 102. His timing was 1:32:28 for the 10 km race. According to Singh’s trainer, Harmander Singh, the marathoner will continue to stay active with light exercise. Most of Singh’s marathons were charity fundraisers, in line with his Sikh beliefs. “There are two noble things in life: one to do charity and other to look after your body,” Fauja is quoted to have said.